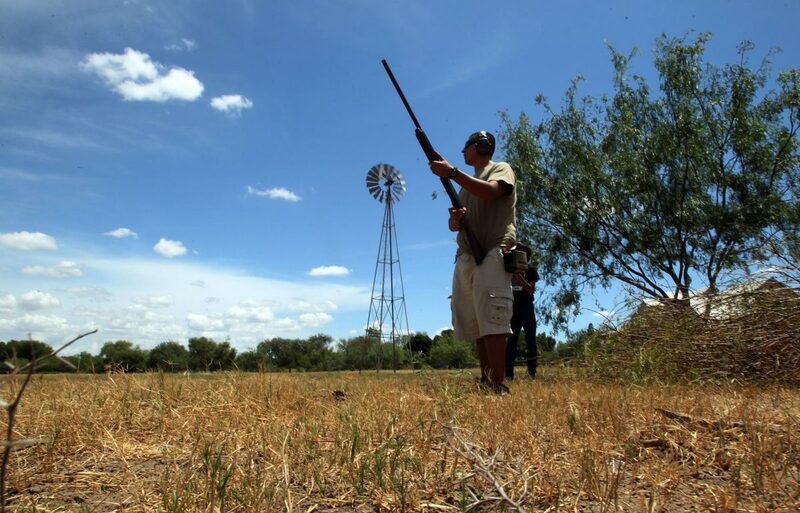 Narciso Martinez of Edinburg using a 12 gauge shot gun to hunt for morning doves and white wing birds during the opening weekend of the 2018 Mourning and White Wing Dove Hunt at Spotted Barn El Cuernudo Ranch on Saturday, September, 1, 2018, in Monte Alto. Hidden behind rows of of cotton and sorghum in rural Hidalgo County lies an iron gate to a ranch dubbed “El Cuacudo,” or “Big Buck,” in English. It’s the perfect place to hunt for doves, which like to feed in the fields of grain. Saturday was the first day of the 2018-19 dove season, the earliest start of the season since 1950. 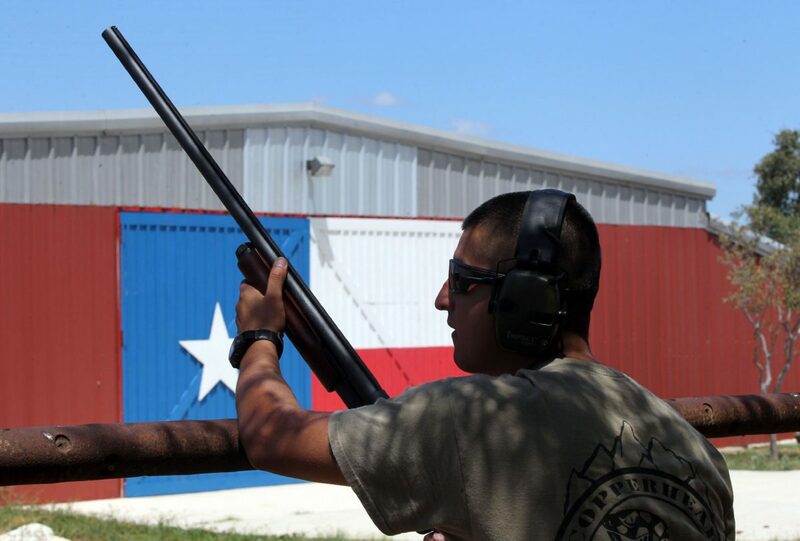 Past a windmill and beyond a bright-red barn, Narciso Martinez, an army recruiter from Edinburg, was leisurely shooting at white-winged doves on Saturday. He made the mistake of starting before noon and was issued a ticket by a game warden. He’s not much of a pro, he admits. It’s only his third year hunting doves, and he does it more to relax than anything else, he said. 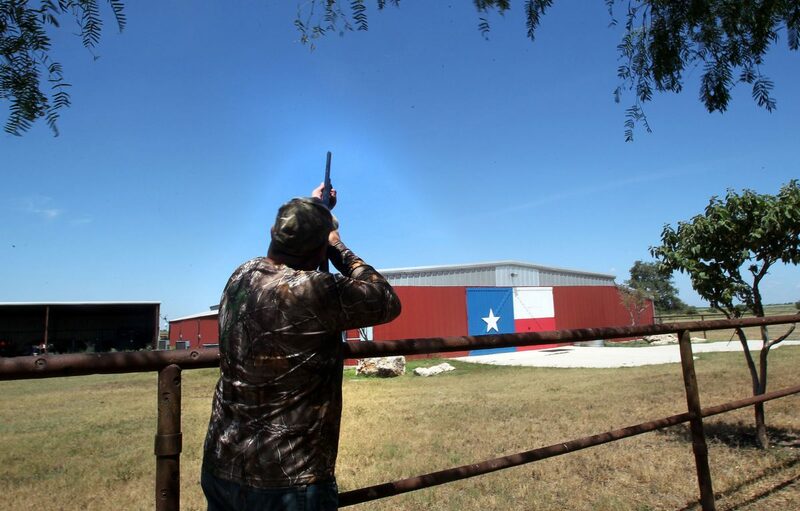 Steve Alonzo of Hidalgo during dove hunting opening weekend of the 2018 Mourning and White Wing Dove Hunt at Spotted Barn El Cuernudo Ranch on Saturday, September, 1, 2018, in Monte Alto. 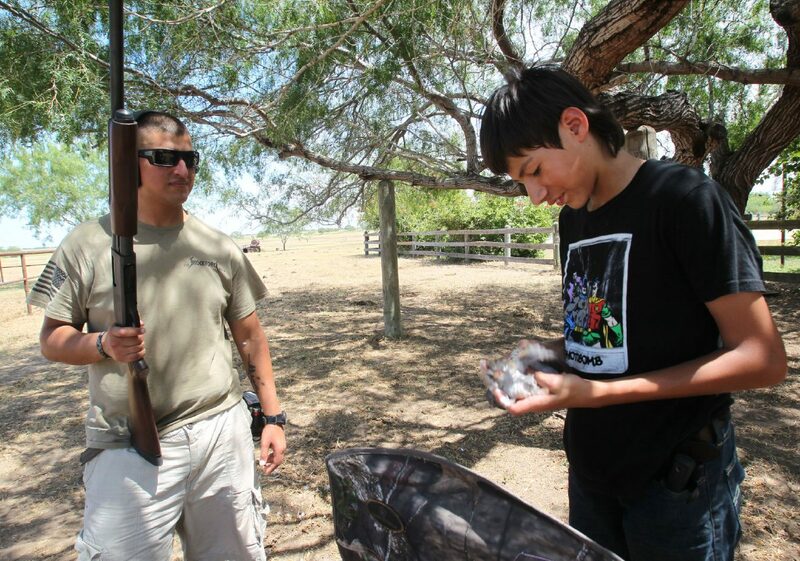 Steve Alonzo of Hidalgo guides Jaaron Martinez,14, on taking off the feathers on a mourning dove during the opening weekend of the 2018 Mourning and White Wing Dove Hunt at Spotted Barn El Cuernudo Ranch on Saturday, September, 1, 2018, in Monte Alto. The 2018-19 regular dove season beings Sept. 14 and runs through Oct. 30, then begins again on Dec. 14 and runs through Jan. 21. Steve Alonzo of Hidalgo trys his hand at dove hunting during the opening weekend of the 2018 Mourning and White Wing Dove Hunt at Spotted Barn El Cuernudo Ranch on Saturday, September, 1, 2018, in Monte Alto. The 2018-19 regular dove season beings Sept. 14 and runs through Oct. 30, then begins again on Dec. 14 and runs through Jan. 21. Additional dove hunting days will be available during the Special White-winged Dove season on Sept. 1-2 and 8-9. Special regulations will apply. 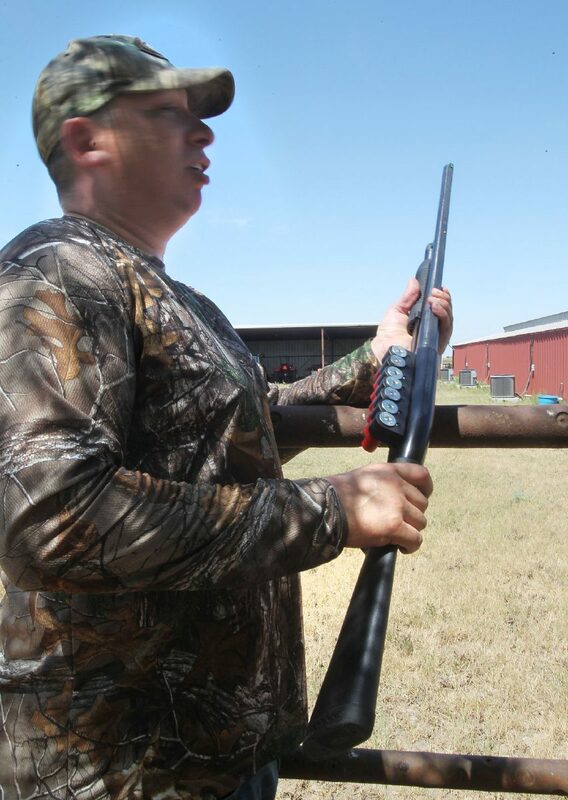 “It really clears your mind,” said Martinez, shooting two rounds out of 12-gauge shotgun at a dove flying over him. No luck. Martinez’s son, Jaaron, turned 14 the same day. He spent it on a camouflage chair, listening to country music and corridos, and playing with a slingshot. If anyone shot a bird, he was ready to go find it. Roy Garza, 73, has owned the 35-acre ranch since 1972. He arrives on a utility vehicle with an empty Natural Light beer can on the passenger side cup holder and a blue heeler puppy chasing him. Martinez and Garza begin discussing high school football, specifically Mission High School’s win Friday night against Veterans Memorial High School. Martinez played football for Edcouch-Elsa High School, and Garza played for Edinburg. Before they knew it, Martinez’s coworker, Steve Alonzo, shoots a bird, but in the wrong direction. Martinez scolds him for shooting toward the house. “Pos I got it, no?” Alonzo quips. Jaaron sprints to find the bird, and after a 15-minute search he finds the dove limp, but he isn’t quite sure what to do with it. Garza, who’s been dove hunting since he can remember, said that’s a common problem with today’s generation. In Spanish, Garza tells and demonstrates to Jaaron how to defeather, gut and clean the bird. Jaaron doesn’t speak Spanish, but he gets the gist of it now. The 2018-19 dove season runs from Sep. 14 through Oct. 30, then begins again on Dec. 14 and runs through Jan. 21.